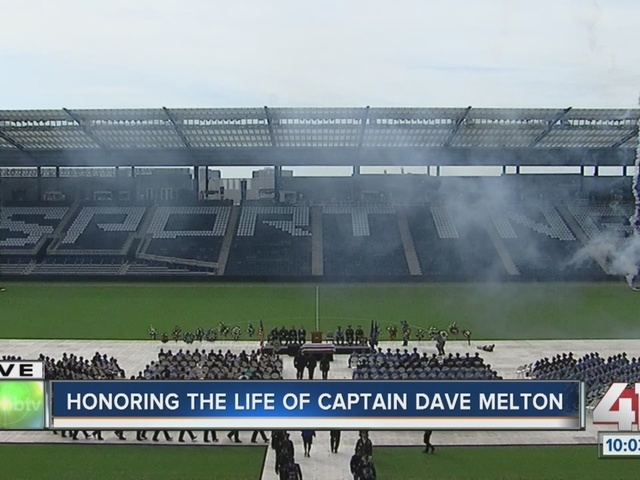 Hundreds of people remembered the life of Kansas City, Kansas Police Captain Robert David Melton on Saturday. The 46-year-old was shot and killed on Tuesday after he responded to a shots fired call. 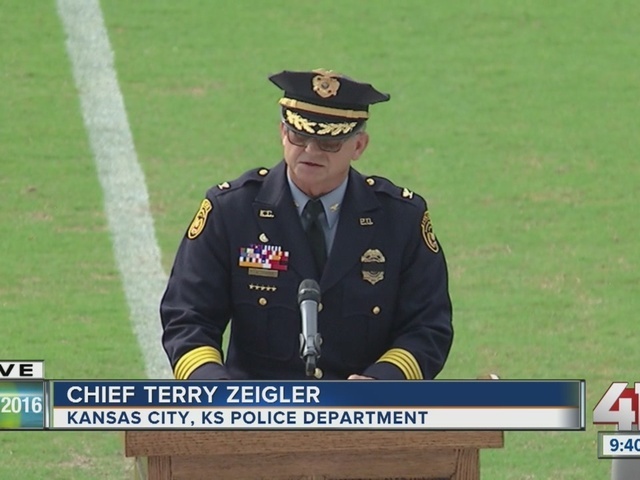 Kansas City, Kansas Police Chief Terry Zeigler said Melton's death did not appear to be to be a planned ambush, but that it appeared he was shot by someone trying to escape from authorities. This is the second loss in three months the Kansas City, Kansas Police Department has faced. In May, Detective Brad Lancaster was laid to rest after being killed in the line of duty . 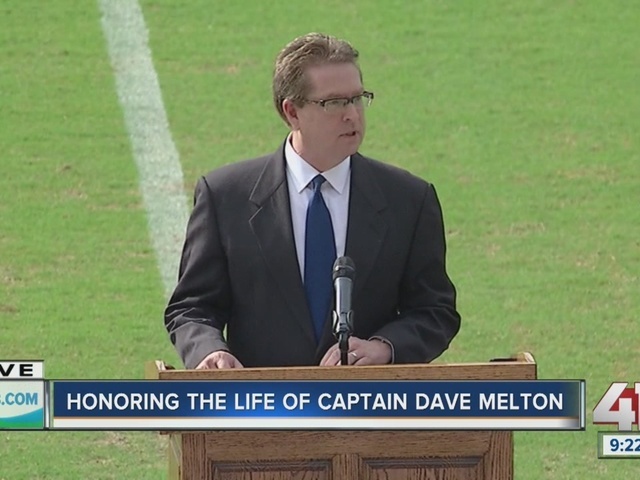 Melton's funeral service was held at Children's Mercy Park. 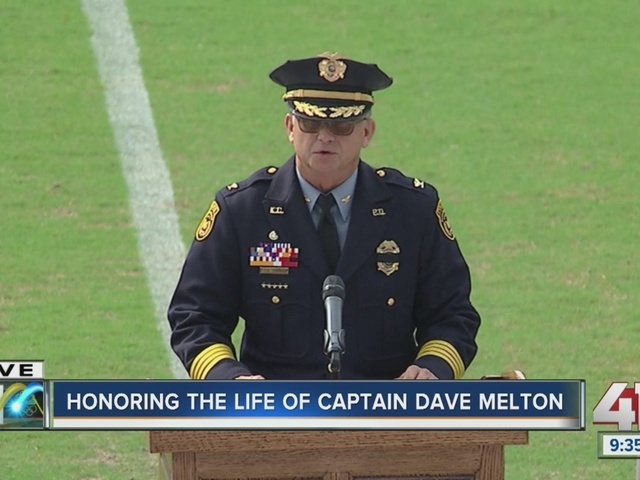 The stadium was filled with people, from near and far, who came to pay their respects to Melton, including police officers from other departments. WATCH: See sights and sounds from the service in the video player above. "Today we want to celebrate Dave's life and the impact he's had on the community and the nation," Reverend Chris Winn of Community Life Church said. Attendees were given a blue and black ribbon with Melton's badge numbers, 1799. While officers from Kansas City, Kansas and other departments wore their badge with a thick, black stripe across. "He has a heart the size of this stadium," Fraternal Order of the Police President Scott Kilpatrick said about the officer who served locally in the Wyandotte County Sheriff's Department and in the National Guard. Melton won a Bronze Star Medal and toured in Iraq and Afghanistan. Zeigler said other officers described Melton as timely, industrious, professional and courageous. "These are the qualities that make an outstanding officer," he said. "He was a go-to guy. If anyone ever had a question, he was the kind of sergeant that watched out and took care of his officers." Taking long, deep breaths and holding back tears Zeigler described the role Melton played in creating a military-style how to manual after Lancaster's death for other officers to follow in the event of a tragic loss. Once the manual was completed, Zeigler said Melton said "It's all done, hopefully we will never have to use it again." "It is with a heavy heart, that we pulled the manual off the shelf to guide us through the process of honoring its author, Capitan Robert Melton," he said. "Dave, I hope we made your proud. We are very proud of you. Rest now brother, We'll take if from here." Fellow officer comforted him as he finished his remarks. 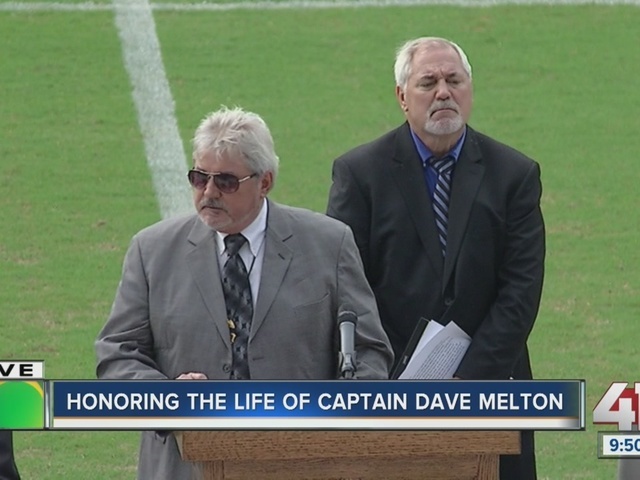 "If Dave was with us today, other than in spirit, he would look around at everyone here and say 'I'm not buying the first round," said Melton's brother Larry, who was joined by his brother John. "That was his sense of humor." 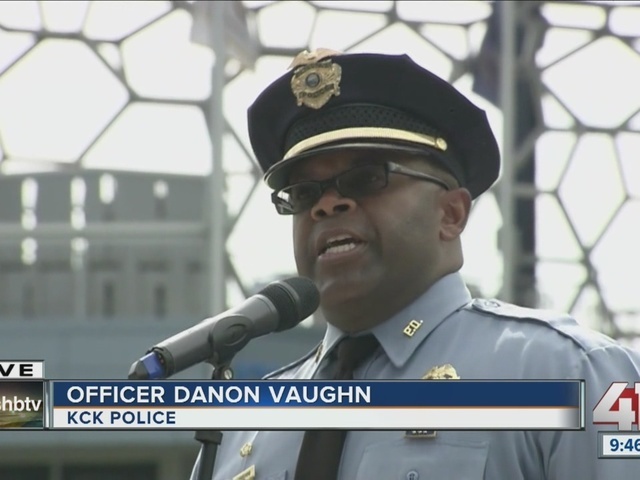 Toward the service, Officer Danon Vaughn sang a moving rendition of "Amazing Grace." Melton's casket was draped in the U.S. flag as a tribute to his service as a police officer and in the military. He was buried at the Leavenworth National Cemetery after the service. In lieu of flowers memorial contributions may be made to the Captain Robert D. Melton Memorial Fund. Price Chopper will collect donations to help support Melton's family. All 52 area locations are accepting donations through July 27. The Kansas City, Kansas Police Department will accept donations.